To say things are “flying high” at the Tucson International Airport is more than just a cliché. A recently completed economic impact study for the Tucson Airport Authority revealed that Tucson’s airport – TUS on your luggage tag – along with Ryan Airfield, west of Tucson, and the businesses located on the airports’ campuses have an annual economic impact of $7.4 billion in Southern Arizona. In addition, direct jobs at TAA’s airports have an individual average annual wage of $81,731 including benefits, which is 174 percent of the Pima County household median income of $47,000. Although a study was conducted in 2012 by students at the University of Arizona Eller College of Management, this is the first time the TAA conducted a full-scale study to understand its economic impact. The study was conducted by Elliott D. Pollack & Company, whose client list includes Arizona cities and towns, county governments and a number of departments in state government. “This is a much more robust assessment of the impact a well-run airport can have on an economy,” said Lisa Lovallo, chair of the TAA board and Southern Arizona market VP for Cox Communications. Approximately 100 tenant companies on the TAA campus were included in the study in addition to the airlines and businesses that support the airport’s operations. Among the others, the most well-known are Raytheon Missile Systems, a maintenance and crew base for SkyWest Airlines (which flies for Delta, United, American, Alaska and other airlines), the Arizona Air National Guard 162nd Wing and Bombardier Aerospace, one of the world’s leading manufacturers of commercial passenger and business jets. Some of the lesser-known businesses included are Ascent Aviation, an aircraft maintenance and overhaul company, and Aerovation, an aeronautical engineering, development and testing company. Direct operations of TUS, RYN and its tenants created 16,180 jobs with wages and benefits totaling $1.3 billion, resulting in an economic impact of $4.5 billion. Using new research conducted in 2017 of airport tenants and airline travelers, the study revealed not only the economic impact to the region, but also the fiscal impact for local governments. The city of Tucson received $36 million in tax revenues from businesses and employees of TAA, as well as airport tenants and tourist spending. This represents 3.7 percent of the city’s operating expenditures. Pima County received $45.4 million in tax revenues, 3.7 percent of its operating expenditures. Tourism impacts were significant as well. A total of $590 million was spent in the area by visitors arriving at TUS. This tourism spending generated approximately $22.5 million in taxes for the city, more than half of its total tax revenues generated by TAA. Taxes earned for Pima County by visitor spending were approximately $19 million, which is 42 percent of the total county taxes received from TAA’s operations. Spending by these visitors generated an additional 8,774 direct jobs with $241.7 million in wages and benefits. Like most commercial passenger airports in the U.S., TAA receives no local government funding. Operations are funded through revenues from public parking, space rentals and use fees, airline landing fees, concessions and land leases. Yet there is more economic potential. A number of parcels of land within the TAA complex are available for lease and several are “shovel ready” with utilities already connected. 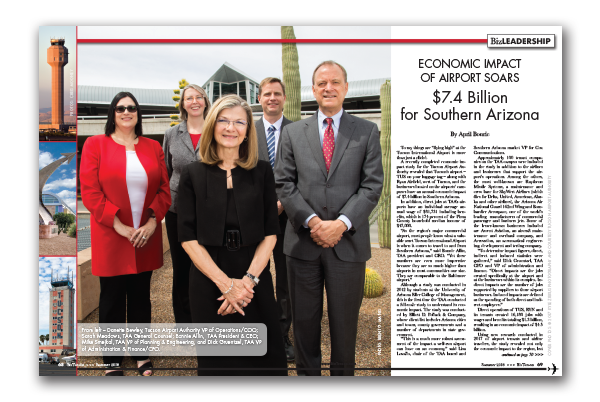 It has been an ongoing goal of the TAA to develop the available land, and to that end, it has entered into a new partnership with Sun Corridor Inc., the economic development organization that works to foster business development in Pima, Pinal, Santa Cruz and Cochise counties. Sun Corridor Inc. is now in charge of promoting the vacant land managed by TAA. The airport will be featured prominently when Sun Corridor Inc. promotes land to aerospace/defense and transportation/logistics companies – two of Sun Corridor’s industry focuses. The promotions will occur regionally, nationally and internationally. “We’ve had an agreement with Sun Corridor Inc. to promote our vacant land since the beginning of their existence,” said Allin. “Our location is perfect for aerospace/defense and transportation/logistics companies. We’re close to Mexico, rail lines, I-10, I-19, and the future I-11. The success of the airport comes from its strong board and its relationships within the Tucson community, Lovallo said. The strength of the airport and its tenants is apparent, Finley said, “Air service is up and the recent renovations that were completed at the airport make us a world-class airport without lines,” he said.